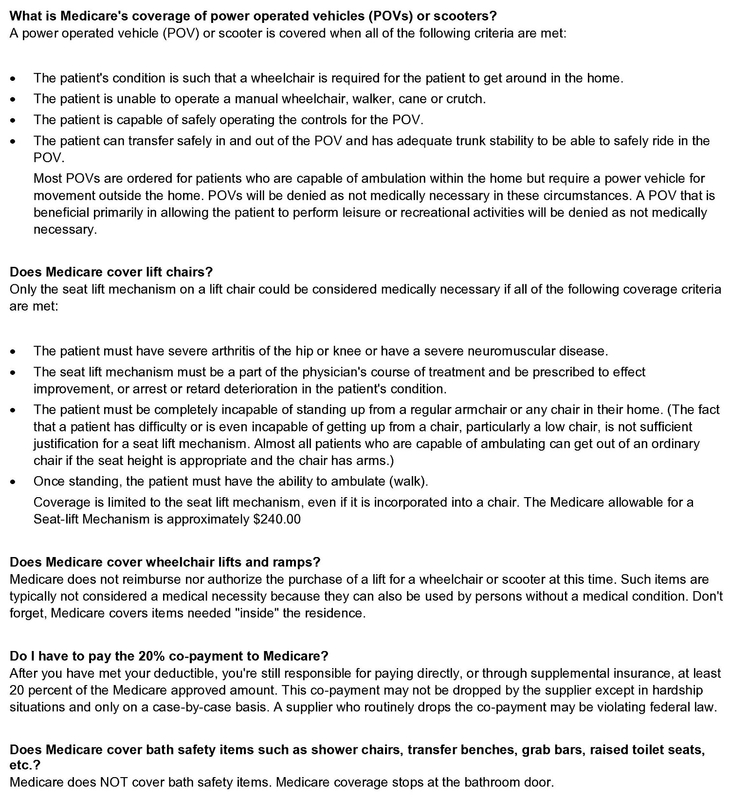 How do I obtain Medicare coverage for medical equipment I need in the home? What does capped rental mean? Are manual wheelchairs covered by Medicare? 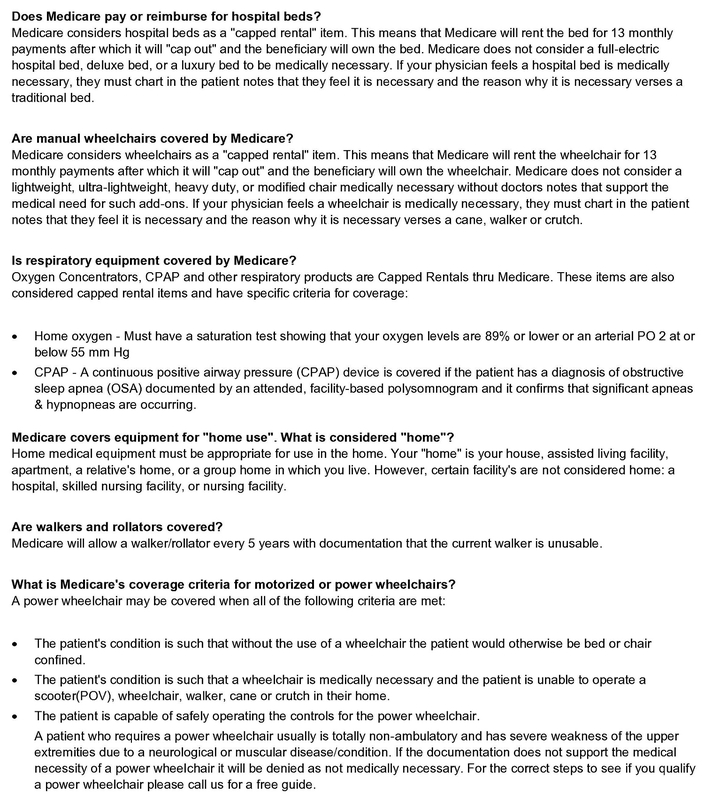 Is respiratory equipment covered by Medicare? Medicare covers equipment for "home use". What is considered "home"? Are walkers and rollators covered? 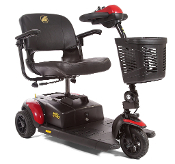 What is Medicare's coverage criteria for motorized or power wheelchairs? What is Medicare's coverage of power operated vehicles (POVs) or scooters? 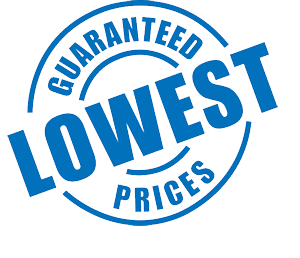 Does Medicare cover wheelchair lifts and ramps? Do I have to pay the 20% co-payment to Medicare? Does Medicare cover bath safety items such as shower chairs, transfer benches, grab bars, raised toilet seats, etc.? Medicaid – A joint federal/state program that pays medical assistance for people with low incomes or very high medical bills, relative to their income and assets. Medicaid is the primary payer of long-term care in our nation. Medicare – The federal health insurance program for people age 65 or older, and for some younger people with a disability. Medicare does not pay for long-term care. (VA) Veterans Affairs - The US Department of Veterans Affairs provides patient care and federal benefits to veterans and their dependents. Co-Pay - The amount an insured person is expected to pay for a medical expense at the time of the visit. Deductible - The amount that an insurance policy holder has to pay out-of-pocket, before reimbursement begins. Home Medical Equipment or Durable Medical Equipment (HME/DME) - A category of devices used for patients whose care is being managed from a home or other private facility, managed by a non-professional caregiver or family member. It is often referred to as "durable" medical equipment (DME), as it is intended to withstand repeated use by non-professionals or the patient, and is appropriate for use in the home. 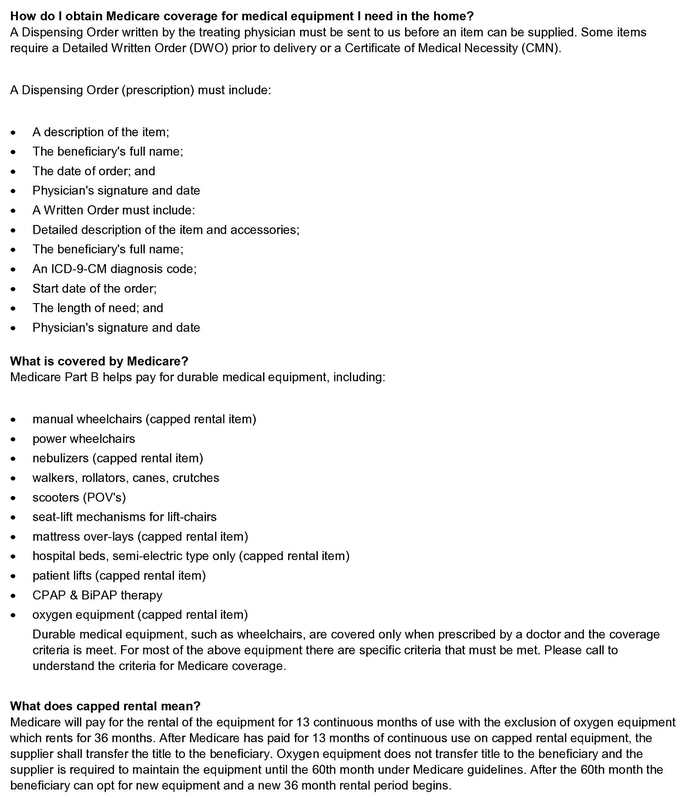 Medical supplies of an expendable nature, such as bandages, rubber gloves and irrigating kits are not considered by Medicare to be DME. Area Agency on Aging (AAA) – A local agency that coordinates and contracts for social services for people age 60 and older in their area. AAAs are funded through the Older Americans Act. Older Americans Act (OAA) – The Older Americans Act was signed into law in 1965. In addition to funding the Administration on Aging, the OAA distributes federal funds to states for information centers about senior services, and to pay for meals and other social services. Reverse Mortgages - A reverse mortgage enables homeowners 62 and older to convert a portion of the equity from their homes into tax-free income without having to sell the home, give up title, or take on a new monthly payment. Capped Rentals –Medicare and many insurance companies will rent respiratory and home medical equipment for a finite period of time, which in most cases is 13 months. During the rental time period, the medical equipment provider is responsible for maintenance and repairs. If the patient continues to use the product after the end of the rental time period, the equipment ownership then transfers to the patient. The patient is then responsible for maintenance and repairs as needed, however some instances may be covered by insurance. Medicaid Waiver Program – The goal of this program is to provide equipment and services that are not covered by Medicare or Medicaid that allow a patient to remain in their home and avoid nursing home care.